description A half-length profile portrait of a young, red-haired woman facing to the viewer's left, holding a baby dressed in white against her right arm, while a little girl, dressed in red, clings to her left. Both children are seen in three quarter face view, each with one hand upon their mother and linked along an invisible diagonal that further strengthens the composition. The vivid red of the toddler's dress and bow and the mother's hair (her one ornament), stand out against the muted background suggesting the drab, postwar austerity of their presumably straitened lives. It also shares a similar palette and composition with 'West Indian Porters', suggesting that the same date, c. 1955, may be tentatively applied to this work too. An opaque area of darker paint above the baby's head suggests possible changes in the composition and the painting probably relates to the oil 'East End Mother and Child', featuring the same red-haired model and baby, but facing the opposite way. 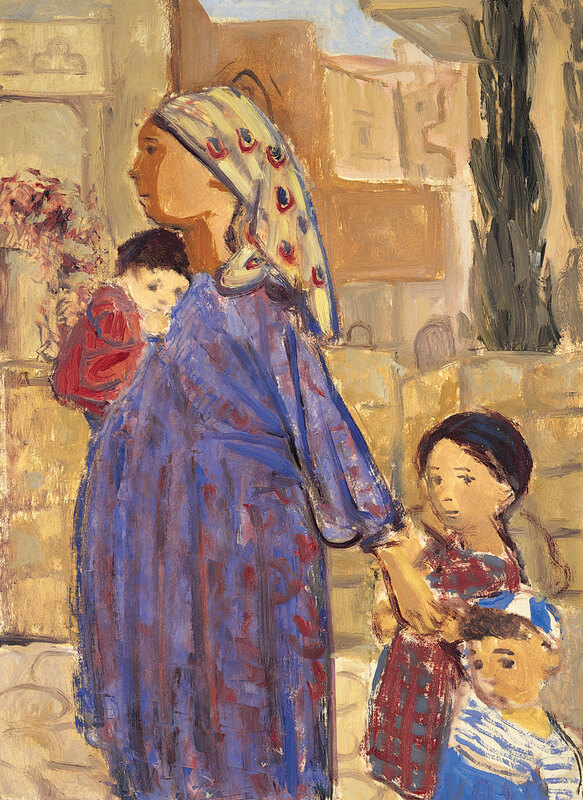 A similar composition can be found in at least two further genre scenes including a woman with two children, and in a further, less finished oil, set in Israel, 'Woman with Three Children'; however, the setting for this work is Whitechapel. Although this was not among the works Frankfurther exhibited at the East End Academy's Annual Exhibition at the Whitechapel Art Gallery in 1955, it is typical of the 'distinguished portraits' she showed there, commended by Mervyn Levy in 'Art News and Review' (24 December 1955). 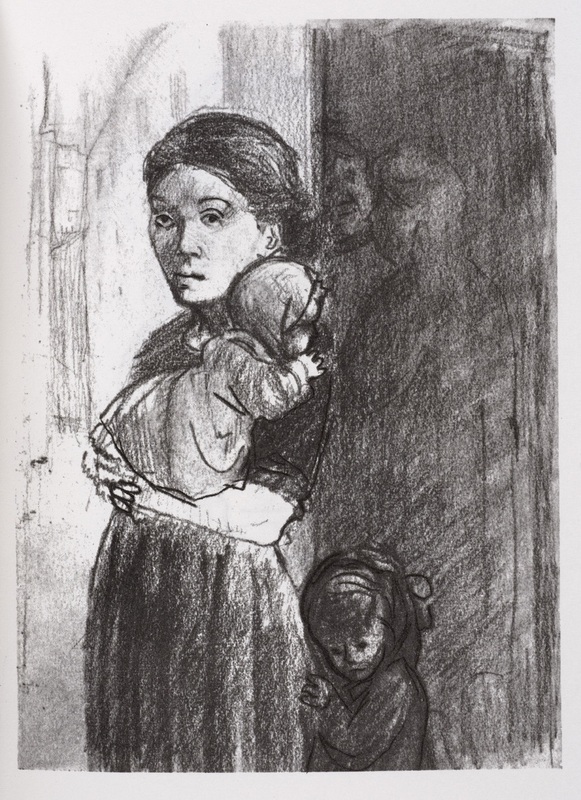 exhibition history (probably) 'Eva Frankfurther 1930-1959: Retrospective Exhibition', Ben Uri Art Gallery, 14 Berners Street, London W1, 14 Feb-9 March 1962, as (21), 'Mother with Children, East End'; 'Eva Frankfurther 1930-1959: Memorial Exhibition', Boundary Gallery, 98 Boundary Road, London, NW8 ORH, 15 June-18 July 2001, (6), NFS; 'Refiguring the 50s: Joan Eardley, Sheila Fell, Eva Frankfurther, Josef Herman and L S Lowry', Ben Uri Gallery and Museum, 108A Boundary Road, London, NW8 ORH, 14 Nov 2014-22 Feb 2015, (32). 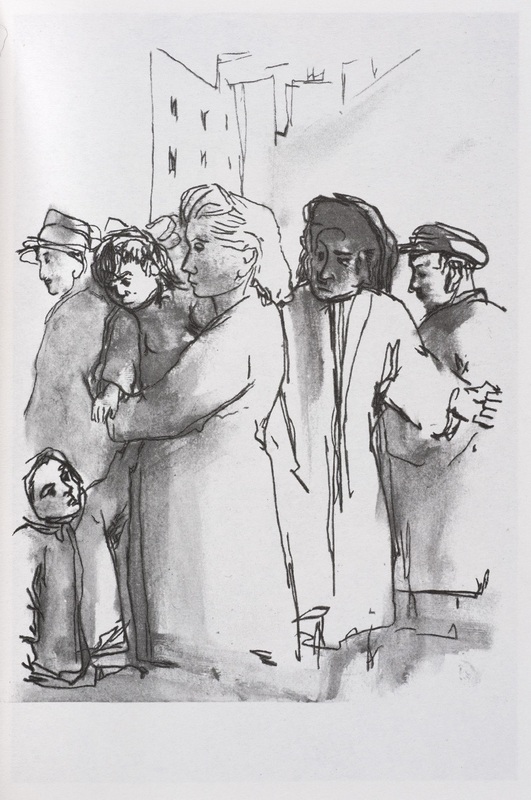 literature ed., B. Planskoy, 'Eva Frankfurther 1930-1959: Paintings, lithographs and drawings' (London: Peter Halban, 2001), illus., p. 62; ed., S. MacDougall, 'Refiguring the 50s: Joan Eardley, Sheila Fell, Eva Frankfurther, Josef Herman and L S Lowry' (London: Ben Uri Gallery, 2014), p. 98., and illus., p. 91.